It was the project that everyone was waiting for with baited breath—when you know how unlikely it is to get tickets to the actual show on Broadway or even now in Chicago (and next year’s National tour, and the eventual West End production), any new content from Hamilton: An American Musical’s creator Lin-Manuel Miranda is met with a unique level of global anticipation, rarely seen in this era’s oversaturated media market. It’s been covered at length in every interview with the now-certified Genius Miranda how he had conceived the idea that evolved into the juggernaut musical originally as a “mixtape” concept album with distinct songs telling different stories about the life of Alexander Hamilton, starting with the title song that he debuted at the White House to skeptical, then converted listeners. Emboldened by the mindset shift that took place in that room where it happened, he then he took the reins in connecting the dots to create the record-breaking Broadway spectacle about the founding of our nation. The timing in which it opened, just as our current political arena faced an eerily similar conflict echoing the racist, classist, and sexist issues that after two centuries are no closer to being solved (because, it seems, they were ignored at our inception), made it a perfect storm to hit the national consciousness and the world turned upside down. So what was the next frontier? Laying to track the songs that were cut from the final stage iteration (there are murmurings that there will be a Mixtape Part II, fingers crossed! ), along with mostly bonafide covers by artists that were rumored to be the thematic inspiration behind the showtunes, and just straight up homages re-imagined by superfans and newbies to the material alike. Celebrities—they’re just like us! So, was it worth the wait? You’ll be satisfied by the renditions of songs that were cut from the musical but have since gone viral on YouTube in one-off performances by the OBC (that’s original Broadway cast), like Angelica Schuyler’s take-down of Hamilton after his affair in “Congratulations,” and Hamilton’s take-down of President John Adams after being fired from the Cabinet in “An Open Letter,” plus the “Cabinet Battle #3” that masterfully debates the practice of slavery (I cringe at writing that there even is an argument, connoting two sides as though they were equal in merit). I think you’ll be equally impressed by the original verses that either amp up the songs from the show or the new anthems written as odes to immigrants and creative geniuses, contributed by the likes of Nas, Busta Rhymes, The Roots, Aloe Blacc and Common. As for the straight covers, I have some questions (a couple of suggestions) on how to keep from detracting from the original masterpiece. What I didn’t quite understand was why some covers addressed the characters originally performing the song while others made the subjects more general, I assume so they can pass as contemporary songs that can get radio play. One song, “Wait For It” even switches back and forth (keeping “Theodosia,” but changing “Hamilton” to “everyone”). Still, the fact that a Broadway musical could inspire straight rappers to contribute new material about their struggles within the context of “The American Experiment” blows my mind and gives me hope for our future. Having gone to the museum in Fraunces Tavern in the Financial District of New York City, where General George Washington last addressed his troops (and supposedly where the song “My Shot,” in the musical takes place), I had a new appreciation for this inspired intro by The Roots referencing John Trumbull paintings, where there are similar works featured prominently throughout the exhibit by another Revolutionary War painter, John Ward Dunsmore.They are gorgeously rendered and unthinkably detailed, in a way that embalms the men who founded our nation in a light of reverence and honor. But as The Roots’ Black Thought warns, “The reality is not a pretty picture, kids.” Such a simple, clever way to prepare the listener to start questioning everything they thought they remembered from their history class. 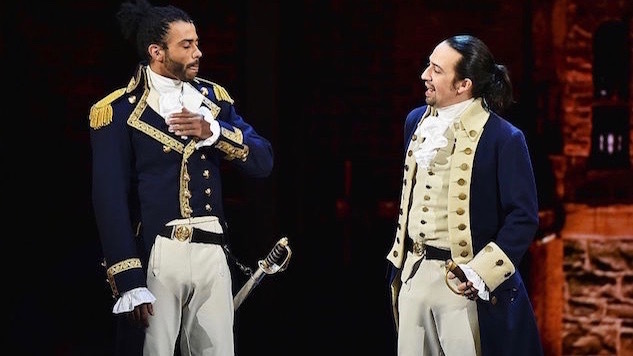 In Miranda’s signature “I Want” song, the character of Hercules Mulligan has a definitive Busta flavor that is elevated when the real thing comes to drop some knowledge on this track. You get chills as he growls his way into the arrangement. The new verses written serve to demonstrate how America know could do to put pen to paper to make change, the way our founding fathers, especially Hamilton, did. This idea is further explored in the next track. Sampling from Hamilton’s breakdown song, “Hurricane,” this track adds a new addictive hook with the rich, silky vocals by Aloe Blacc. This song seems to contain the most personal verses from Miranda, as he reflects on being bullied as a kid for expressing his feelings and creativity. Who’s laughing now? “F*cking right” he’s relentless… and like the character he played, Miranda seems to write like he’s running out of time. This is one of my favorite songs from the musical, and I love Usher, but it was a lot of live up to when it was originated by Leslie Odom Jr., who won the Tony Award for the role. Usher really delivers a good vocal, especially after the climax of the song—he almost won me over into thinking he could slip into this role if he set his sights on Broadway.